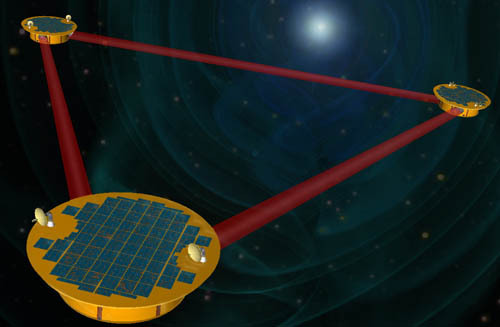 The space-borne gravitational wave detector, LISA, was studied in great detail as a collaborative mission between NASA and ESA. Ultimately, NASA and ESA decided in 2011 not to proceed with the mission. LISA was not the highest ranked mission in the 2010 Decadal Survey and funding constraints prevented NASA from proceeding with multiple large missions. In 2013, ESA selected the Gravitational Universe as the science theme for the third large mission in the Cosmic Visions Programme (L3). ESA is currently developing a mission concept for L3 which may include substantial contributions from NASA. NASA's L3 Study Team is currently studying potential US contributions to this effort. The Laser Interferometer Space Antenna (LISA) is a joint NASA-ESA project to develop and operate a space-based gravitational wave detector sensitive at frequencies between 0.03 mHz and 0.1 Hz. LISA detects gravitational-wave induced strains in space-time by measuring changes of the separation between fiducial masses in three spacecraft 5 million kilometers apart. LISA will discover many extraordinary astrophysical sources: tens to hundreds of inspiraling and merging massive black hole binaries out to a redshift of z ~20; tens of stellar-mass compact objects spiraling into central massive black holes out to z ~1; more than ten thousand close, compact binaries in the Galaxy; a sky map of the background made by millions more; and possibly backgrounds of cosmological origins. The all-sky instrument will see thousands of sources in the first few months of operation. Astrophysical parameters, such as mass, spin and luminosity distance, of many sources will be measured with uncommon precision. LISA will track more energetic inspirals for weeks to months, predicting progressively more accurate sky position and luminosity distance of the merger for electromagnetic observers. Owing to the revolutionary nature of gravitational wave detection, the numbers and types of LISA sources are somewhat uncertain. Fortunately, there are guaranteed sources, close white dwarf binaries known from electromagnetic observations, and many others that LISA should see in large numbers unless the Universe is radically different than electromagnetic observations have led us to believe. By virtue of opening a new spectrum, gravitational wave astronomy promises once-in-human-history discovery potential. Gravitational wave observations will enable studies of: the formation and growth of massive black holes and their co-evolving host galaxies; structure formation; stellar populations and dynamics in galactic nuclei; compact stars; the structure of our Galaxy; General Relativity in extreme conditions; cosmology; and searches for new physics. Information from LISA sources will provide unique insight into extraordinary astrophysical objects. Combined with electromagnetic observations, these insights will advance the broader scientific understanding. The European Space Agency has selected The Gravitational Universe as the science theme for the 3rd large mission in the Cosmic Visions Programme and expects to issue a call for mission concepts in the near future. NASA is interested in participating in this effort as a junior partner and has formed the L3 Study Team to help understand what role NASA might play. In addition, the ESA-led technology demonstrator, LISA Pathfinder, successfully launched on Dec. 2nd, 2015 and expects to begin science operations in early March. Based on discussions with the European Space Agency (ESA) at the recent ESA-NASA bilateral meeting, we provide the following information concerning LISA. Readers are advised to refer to any ESA postings - when available - for details and clarifications regarding the Cosmic Vision Programme. LISA was competing with x-ray and outer-planets missions for the L1 opportunity in ESA's Cosmic Vision Programme (2015-2025). The decadal rankings and NASA's constrained out-year resources, projected in the President's FY12 Budget Request, led ESA to conclude that none of the three mission concepts were feasible within the Cosmic Vision L1 schedule. Read more here. The Astronomy and Astrophysics Decadal Survey, conducted by the National Research Council, has released the final version of the Astro201 report. [Astro2010 Reports] Reports from the various panels are also available in pre-publication form. LISA was given a high priority among large space projects. The "...recommendation and prioritization reflect its compelling science case and the [high] relative level of technical readiness" compared to other opportunities.